Know a friend who needs a new deck, fence or pool? Maybe they’re interested in landscaping or a total backyard make-over. Complete and submit the form below to refer them to Creative Homescapes. We’ll help them create the backyard oasis of their dreams – and you can get rewarded too with a $100 Creative Bucks gift card! Refer a friend to Creative Homescapes. 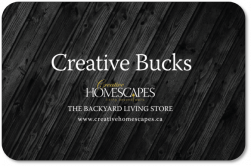 If they spend $5,000 or more on a backyard project of any kind, we’ll give you a $100 Creative Bucks gift card, which you can use toward any Creative Homescapes product or service.